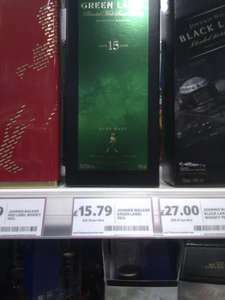 Was browsing the scotches and saw a shiny tin of red label for £18, then beside it, and I had to do a double take, Green Label £15.79!!! Black label beside it was £27! Maybe store specific, as it was on a regular price white label. Normally around £30 so definitely worth a peak down your whiskey aisle! Wow of this is for real I will clear out my local. Great blended Whisky. Hope you bought a few op! Great botlle of scotch - maybe a blend, but a blend of four 15 year old single malts. Great find - hope it doesn't end up like the pre-Christmas Gentleman Jack fiasco. Just checked my local. None in, not a spot for it. I guess left overs from christmas? I've been to two tescos and neither have a spot for it. I then called tesco custumer service and they can't search by product they can only search by store. The lady on the phone tried telling me that my local stores only stock red label, I know this not to be true because the store I went in today sells black label which is the most common of the Johnnie Walker brands. Can anyone tell me which stores are stocking the Green Label as I really want some. Hope you guys that got it didnt drink it. Worth a fortune soon! Discontinued!